The number one concern of summer travelers researching travel insurance is how their trip will be affected by hurricanes or other severe weather events. When traveling during the Atlantic hurricane season, June 1st to November 30th, you must plan for unexpected weather patterns. If you read nothing else in this article, although all of it is important and we highly recommend you do, know this: purchasing your travel insurance plan prior to a storm being named should provide you coverage for travel concerns that arise due to that storm. If a hurricane or tropical storm that affects your trip is predicted prior to you purchasing a plan, your coverage may be extremely limited. Are you planning to travel between June 1 and November 30? This is the "hurricane season" in the Atlantic region. If you are traveling at all during these days (even just returning from a trip in early June), we highly recommend you purchase a plan. It can help to reimburse additional expenses, up to the policy limit, for an extended stay due to grounded flights or an interrupted trip due to damage of your primary residence. Are you traveling to or through any destination on the East Coast of the United States, or in the Atlantic region? The Atlantic region (or East Coast of the United States or the Caribbean) is the prime area for hurricanes. The most impactful hurricanes in the last decade hit the mid-Atlantic region of the United States east coast, the Texas, Florida, Alabama and Louisiana coastlines; twice. Do you live anywhere on the East Coast of the U.S. or in the Atlantic Region? If you live in an area where hurricanes are known for tormenting, travel insurance can help you out – even if you are leaving the area entirely. If you are on a trip away from home when a hurricane hits and your primary residence is made uninhabitable, your plan may provide trip interruption coverage which may help to defray the cost of returning home and provide reimbursement for unused pre-paid, non-refundable trip costs. Hurricane season is six months out of the calendar year. Six. That’s a large window of time that Mother Nature can wreak havoc on the travel industry. Depending on the travel investment you are making, you should consider purchasing a travel insurance plan if you answered yes to any of these questions. But how exactly does a travel insurance plan cover you if bad weather should occur? Let’s go back to that fun fact we shared at the start of the article: purchasing your plan prior to a storm being named should provide you coverage for travel concerns that arise due to that storm. Airline or cruise line cancels or delays the trip due to weather: If your airline or cruise line cancels or delays your scheduled departure due to bad weather, you may be eligible for the trip cancellation, travel delay or trip interruption coverage on your plan. This can help to reimburse you for the unexpected, added expenses for being held in transit longer than expected. Depending on the plan, you may even be eligible for inconvenience benefits if there is a change to your itinerary. Your destination is under a hurricane warning: Some travel insurance plans will have coverage that becomes eligible for reimbursement when a destination is under an NOAA-issued Hurricane warning or alert. * It’s important to know how detailed your travel insurance plan is in regards to specific hurricane warnings and coverage eligibility. Accommodation cancels a reservation because of storm damage at destination: If a storm hits hard prior to your arrival date, a hotel, resort, or vacation rental may cancel your reservation because it’s devastated and made uninhabitable by a storm. Travel insurance plans typically provide coverage for this. A reimbursement for this can help if the accommodation you selected does not provide a full refund for your pre-paid reservation. You must cancel or interrupt because your home was made uninhabitable by a natural disaster: The right travel insurance plan doesn’t just protect you in case something should damage or destroy your destination - but also your home. If you cannot travel because you need to tend to damage done to your primary home, you may be eligible for reimbursement due to cancellation or interruption of your trip. Going home early because your destination has become uninhabitable while you are there: It could be a scary situation to be on vacation when a dangerous storm rolls through. A travel insurance plan could provide coverage for trip interruption (going home early) because your accommodations have become uninhabitable during the storm. 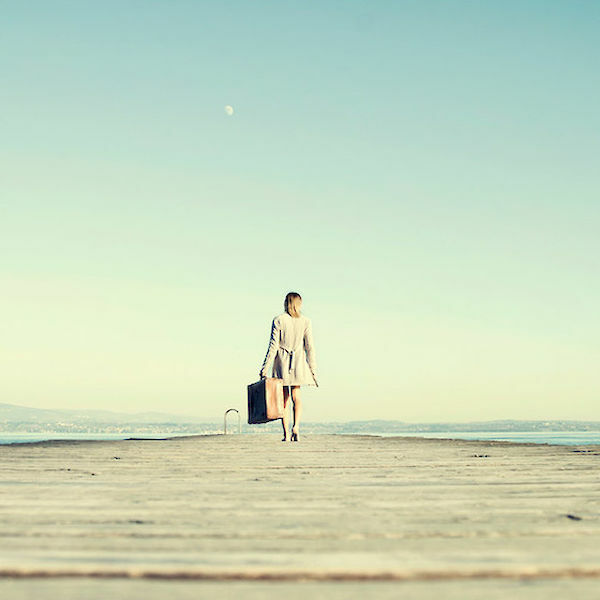 These are a handful of reasons travelers have found travel insurance to be helpful in recouping lost travel expenses. If you are traveling and think you may be able to be reimbursed for unexpected expenses due to bad weather changing your travel plans, keep your receipts and document everything possible. Call your travel insurance company and any travel suppliers that may be affected by the change as soon as possible. All of this will help minimize possible slow downs during a claims process. The National Hurricane Center (NOAA) periodically issues advisories and warnings for hurricanes around the world. Some travel insurance plans will provide specific coverage if the NOAA issues a hurricane warning for your destination, while other travel insurance plans have general coverage for severe weather that affects a trip. If you are particularly concerned about a hurricane causing havoc on your planned trip, you should consider a plan that has coverage for NOAA warnings. This could maximize your trip cancellation coverage, and provide reimbursement of your pre-paid, non-refundable trip costs. This may be an added benefit because many hotels, resorts and tour operators may not provide reimbursement unless the storm prohibits them from providing service. A plan with NOAA warnings as a listed covered reason would allow you to stay safe without risk of losing pre-paid, non-refundable trip costs. Every plan will have different requirements that must be met for this coverage to be available. Generally, however, travel insurance plans provide coverage for trip cancellation, interruption and delays for bad weather patterns that disrupt travel plans. A typical comprehensive travel insurance plan will not provide specific coverage for NOAA warnings. According to Wikipedia, Hurricane Alley is the area of the Atlantic Ocean stretching from northern Africa to the Gulf Coast of Central America and the Southern United States. Scientists believe that the water in this area of the ocean is gradually warming, thus leading to more frequent hurricanes. 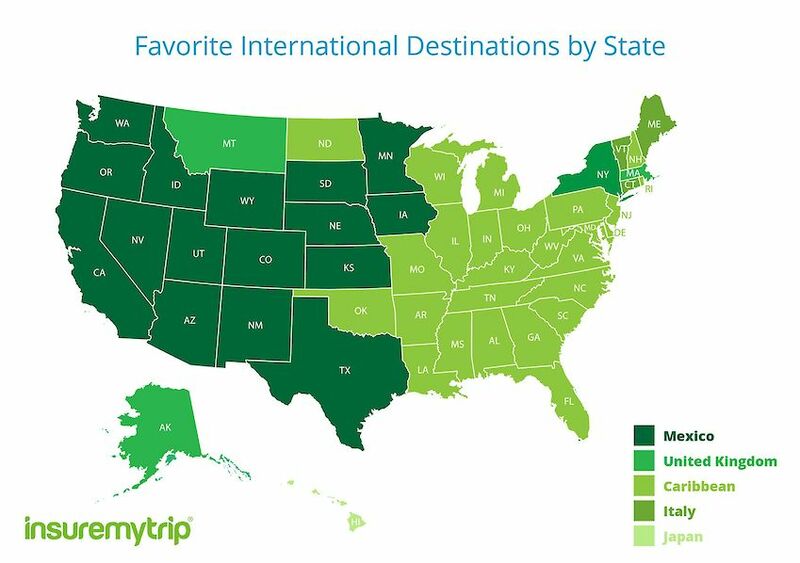 Some of the most popular travel destinations for InsureMyTrip travelers are located in Hurricane Alley. Most Caribbean islands are often plagued with hurricanes and this can affect resort vacations as well as cruise itineraries. Any destination on the East Coast of Central America - like Cancun, Mexico or Costa Rica – or on the southern coast of the United States – like New Orleans, Louisiana or Panama City, Florida - are vulnerable to hurricane level weather patterns. Not only are these popular travel destinations, but these coasts are hubs for domestic and international airline connections. Even if your final destination is not at risk for a hurricane, the city you are stopping at for a connecting flight may be at risk for severe weather. All this said: don’t let the fear of hurricanes change your dreams of seeing the white sands of the Caribbean or scare you away from the experience of a Jazz festival in New Orleans! With a few adjustments to your travel routine, you can adequately prepare yourself for the possibility of a hurricane affecting your trip. Plan Ahead. You’ve booked your trip, told everyone how excited you are, officially put it on your calendar and then realized it falls during the months of peak hurricane activity. Invest in travel insurance now. You may have more options with any available time-sensitive benefits and can protect yourself from unforeseen storms. Understand the “unforeseen”. A plan will only cover unforeseen events. In loose terms, if the storm has been predicted (and named) by weather experts, you will not be covered by a new plan. If you already had an existing plan in place before the storm showed on radar, you should have protection. All plans are different, so be sure to read how your plan explains unforeseen events and coverage due to inclement weather. Know how your travel suppliers will react. If you are traveling to a destination located in a hurricane region, this most likely won’t be their first rodeo. They are experts in severe weather. Call your airline, cruise line and/or resort to understand how they will react to hurricanes. Then talk to us about what this means for possible coverage options you may want to consider. Bring your important plan information. We recommend that you bring your entire plan document with you on your trip. This way you’ll be able to reference how your plan can help you in any situation. If you opt not to, you definitely need to bring the confirmation number and policy number from the insurance company as well as their claims/emergency assistance contact information. If you do stumble upon a need for your plan, you’ll need to reference that basic information when calling the company. Don’t stress out. We know it can be scary or disappointing to be faced with a hurricane before or during your trip, but the reason you have travel insurance is so you can travel worry-free. If a hurricane does affect your trip; remember, you have that to protect the cost of your trip or to get you home. Call the insurance company to find out next steps for your situation.Which Plan has the Best Hurricane Coverage for Your Trip? Why Plan Has The Best Hurricane Coverage For Your Trip? The following plans are available for purchase on InsureMyTrip and have specific coverage if a hurricane should affect your travel plans. Keep in mind, the coverage listed below is general to the plan and may vary by state residence. Travel insurance is regulated by the state and coverages may change based on the state in which you live, so verify all coverage details when comparing quote results. AIG Travel Guard: All Plans. Will provide coverage for cancellation or interruption if the destination has been made inaccessible or uninhabitable by a named hurricane. Claims are not payable if the plan was purchased after the stormed was named. Also, claims will only be payable if the trip or part of the trip was within 30 days after the named hurricane makes the destination uninhabitable or inaccessible. Arch RoamRight: All Plans. 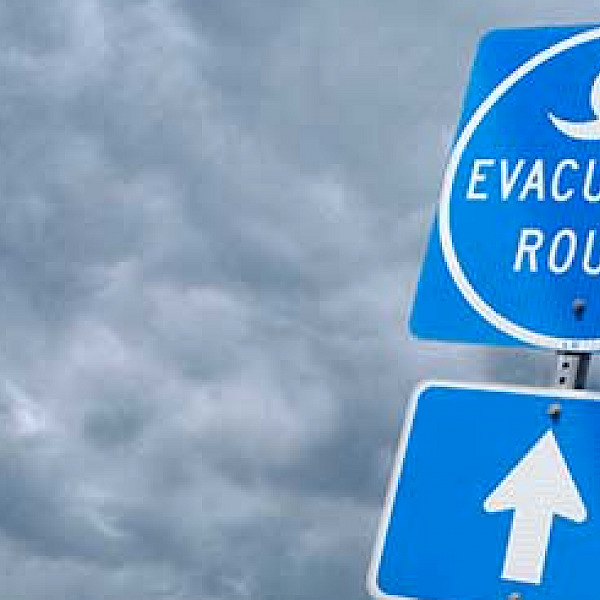 If a mandatory evacuation is ordered by the local government due to a natural disaster or a hurricane named after the effective date of the plan, you may be eligible for trip cancellation/interruption coverage. You must have 50% or less of your trip left for the benefit to be payable. AXA Assistance USA: Gold & Platinum. Weather that causes complete cessation of services of the common carrier for at least forty-eight (48) consecutive hours and prevents you from reaching your destination. This benefit will not apply if the potential natural disaster has been forecasted or a storm has been named prior to purchase of this coverage. Also, natural disaster at the site of your destination that renders your destination accommodations uninhabitable. Berkshire Hathaway Travel Protection: All Plans. Will provide coverage for cancellation or interruption if the destination has been made inaccessible or uninhabitable by a named hurricane. Claims are not payable if the plan was purchased after the stormed was named. Also, claims will only be payable if the trip or part of the trip was within 14 days after the named hurricane makes the destination uninhabitable or inaccessible. C&F Travel Insured: Worldwide Trip Protector & Worldwide Trip Protector Plus. You can cancel your trip within 48 hours of your departure date if your final destination is under a hurricane warning issued by the NOAA, provided the cancellation does not occur within 14 days of the plan’s effective date. Generali Global Assistance: All Plans. You can cancel your trip if a mandatory evacuation is ordered for your final destination due to adverse weather or a natural disaster. You must have 4 days or 50% of your total Trip length or less remaining at the time the mandatory evacuation ends. Claims will only be paid if the trip and parts of the trip are within 30 calendar days after the evacuation order was issued. iTravelInsured: All Plans. You can cancel your trip within 24 hours of your scheduled departure if your destination is under an NOAA hurricane warning, provided the cancellation occurs 14 days or more after the plan’s effective date. Trip Assure: All Plans. You can cancel your trip within 24 hours of your scheduled departure if your destination is under an NOAA hurricane warning, provided the cancellation occurs 14 days or more after the plan’s effective date. Travel Safe: Classic. You can cancel your trip within 36 hours of your departure date and time if your destination is under an NOAA hurricane warning, provided the cancellation happens 14 days or more from your effective date. Travelex: Travel Select. A named hurricane causing cancellation or interruption of travel to your destination that is inaccessible or uninhabitable. Claims are not payable if a hurricane is foreseeable prior to your effective date. A hurricane is foreseeable on the date it becomes a named storm. The company will only pay the benefits for losses occurring within 14 days after the named hurricane makes your destination uninhabitable or inaccessible. Flight cancellation policies vary by airline and circumstance. When an airline cancels a flight due to bad weather, most will try to rebook passengers on the next available flight. Airlines are not required to reimburse travelers for losses incurred as a result of a canceled flight due to weather. Travelers concerned about protecting pre-paid, non-refundable trip expenses should buy travel insurance. Travelers flying in-or-out of these airports during hurricane season, may be more apt to experience travel hiccups, according to InsureMyTrip research. 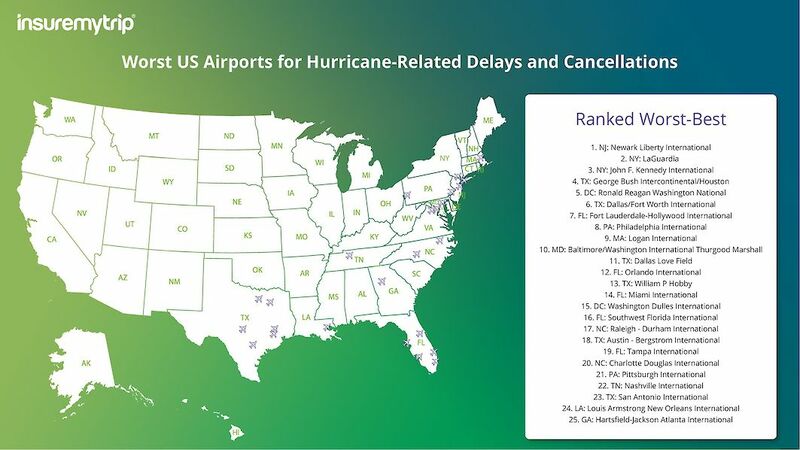 This map shows the worst airports for hurricane-related delays and cancellations. Also, Americans travel frequently to areas like the Caribbean and Mexico, that are more likely to be affected by tropical storms. 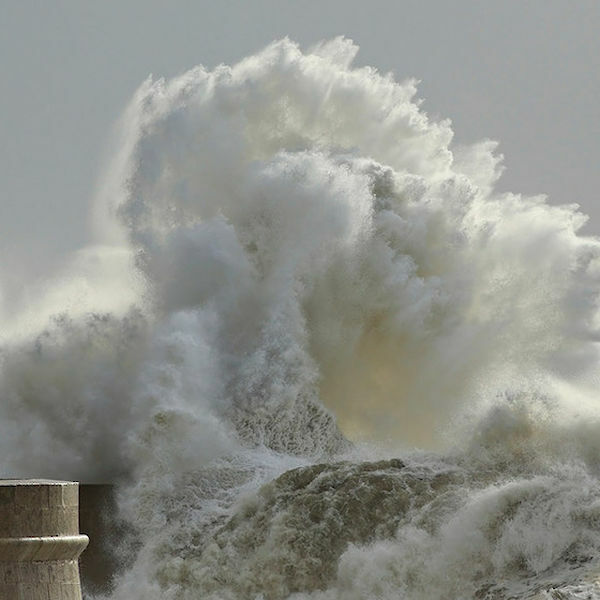 How Does Travel Insurance Apply to Named Storms? I am a resident of Russia, can I buy an insurance for travelling to USA and Caribbean - i am interested in travel insurance for hurricane season. Unfortunately, for non U.S Residents, we are only able provide medical and medical evacuation coverage. If this is something you are interested in, please view the plans shown under the "medical" tab once you arrive on the results page.